Midwest Hardwood Corporation has earned a reputation as one of the premier hardwood log suppliers in North America. 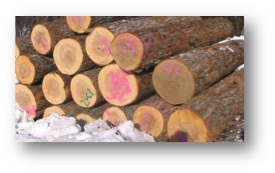 We are recognized for being a first-class log supplier to the global wood products marketplace. 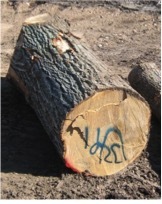 Our professional foresters hand-select only the best logs for our export program. Through years of experience, we have refined our operations to efficiently harvest and ship high quality logs worldwide. 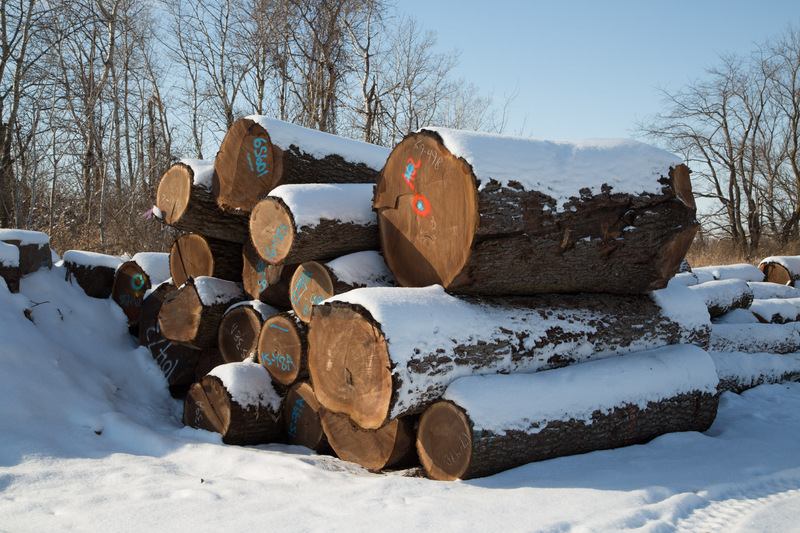 Midwest Hardwood Corporation offers a wide selection of Black Walnut (Juglans Nigra) logs; all grades and dimensions are continuously available as procurement staff maintains a steady flow of Walnut from the very best regions of the American Midwest. From the felling of the tree to the transport of the logs to the loading of the container the experienced Midwest Hardwood Corporation staff monitor the quality and care of the logs throughout the process. Detailed attention is professionally rendered to each and every log to insure a high quality product that meets all the customer’s needs. Midwest Hardwood Corporation handles all the Northern Hardwoods in it’s day to day operations and is located in the middle of the best Sugar Maple (Acer Saccharum), Red Oak (Quercus Rubra), and White Oak (Quercus Alba) the American Midwest has to offer. The color and the quality of the Midwest’s Northern Hardwoods are the best to be found. Filling out the list of species available from Midwest Hardwoods are the Hickories (Carya Ovata, Carya Glabra, Carya Cordiformis), Basswood (Tilia Americana), Black Cherry (Prunus Serotina), Black Ash (Fraxinus Nigra), White Ash (Fraxinus Americana), Green Ash (Fraxinus Pennsylvanica), Red Maple (Acer Rubrum), Red Elm (Ulmus Rubra), Grey Elm (Ulmus Americana), Yellow Birch (Betula Alleghaniensis), and Paper Birch (Betula Papyrifera), Burr Oak (Quercus Macrocarpa), and Black Oak (Quercus Velutina). Experienced Midwest Hardwood Corporation staff possess the understanding and knowledge of the intricacies of all the species that they handle, assuring the customer’s needs, from the stump to the container, are consistently met. This is a straight, sound sawlog. The grade allows 1 face to have a sound-sawn limb, or several minor surface defects. The other 3 faces must be clear. Some minor peck, or minor internal imperfections such as pin knots are allowed. The grade allows one full length seam, however all faces must then be clear. This is a straight log with straight grain. It has centered heart. It will consist of a first cut. 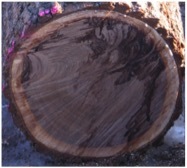 Medium texture with consistent growth rings. Grade does not allow any peck, discoloration, ingrown bark. There should be minimal pin knots. Grade will allow a minor 10 cm or less, defect on 1 face. This is a premium 3SC log that has the structure for quarter slicing. A true Rift Quality Slicer log is also available upon request. This is a straight log with minimum grain twist. It has a well centered heart. Generally it is a first cut, but will allow an exceptional 2nd cut. Grade allows a minor surface defect that consists of a small bump 10 cm in diameter or smaller. Grade allows a short shallow seam running 30 cm or less from one end. This is a straight log with straight grain. Clear log, with no internal defects. Suited for high quality, plain sliced, panel production. Logs are well structured. This is a straight log with straight grain. 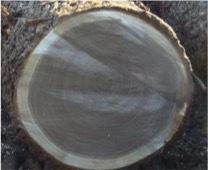 Log is large in diameter and suitable for producing rift veneer. Logs are well structured and clear. These are large diameter, sound, character logs. Available in 1SC, 2SC, 3SC or premium. Logs can have large crotches with heavy figure. 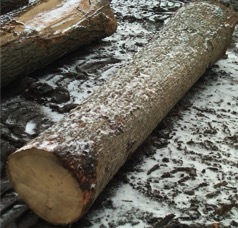 Special arrangements can be made to select logs that best fit the end use. Available in other species as well. This is a straight, sound sawlog. The grade allows 1 face to have a sound-sawn limb, or several minor surface defects. The other 3 faces must be clear. Some minor peck, or minor internal imperfections such as pin knots are allowed. The grade allows one full length seam, however all faces must then be clear. Log is suitable for premium solid lumber productions such as premium wide flooring. This is a straight grain true veneer log. 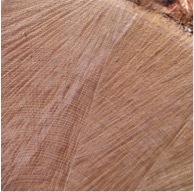 White Oak is available as plain-slice logs or in rift diameters. Available in 3SC as well. This is a straight log with straight grain. It has centered heart. It will consist of a first cut. 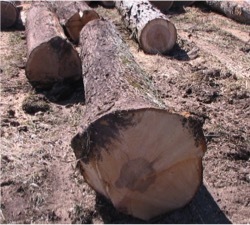 Logs are sourced from the Northern Region of the Eastern United States. Long winters and short summers produce very slow growth, tight texture, and light color. If you are truly demanding a high quality red oak supply, this would be an excellent choice. Log is suitable for higher end panel production. Northern Red Oak is available in 3SC Veneer as well. This is a straight log with straight grain. It has centered heart. This is a larger diameter veneer log well suited for Quarter and Rift Slicing to produce true right or quartered veneer. This log is available in 3SC as well. This is a veneer grade log. It is a good choice for producing whole piece rotary veneer or sliced veneer. This is a straight log with straight grain. It has centered heart. 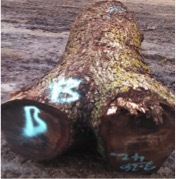 Logs are sound and will allow 1 to 2 small defects. Heart size is not a restriction. This log is a very good choice when solid maple veneer is needed, but it does not have to be white. Log is popular with manufacturers of thick stock veneer for plywood production such as skateboard and snowboard decking, or dieboards. This is a straight log with straight grain. It has centered heart. It will consist of a first cut. 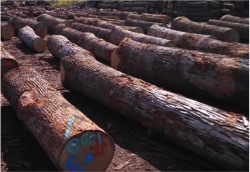 Logs are sourced from the Northern Region of the Eastern United States. 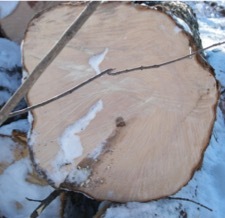 Long winters and short summers produce white sapwood, with little sugar. Heart size will be 1/3 heart or less, unless otherwise specified. Log is suitable for higher end panel production. This is a veneer grade log. It is a good choice for rotary veneer production. We can offer it in a range of different length and diameter combinations. Basswood is a light colored wood that is easy to work with.